How on earth do these guys introduce themselves at concerts? Do they really shout “empire” twice? Actually, they’re probably the type to take the stage (or cleared area on the floor of a crowded basement) and play an entire set without so much as an introduction. There’s only one type of music that a band with a name like this could make: ’90s-midwestern-inspired-emo. As a fan of both the genre and this record, there’s only so much trashing of the moniker that I can do without feeling a little guilty. And this stuff is actually really good. Musically, they remind me a bit of American Football, a band that I originally didn’t like. 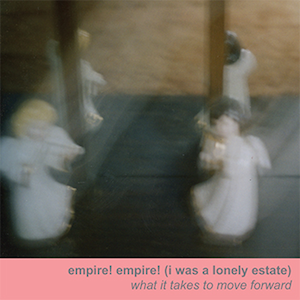 While American Football is growing on me slowly, there’s no disconnect between Empire! and my ability to enjoy their music immediately. These guys really keep things interesting throughout the entirety of What It Takes to Move Forward. Loud, powerful, and trebly guitars dominate the record, and sound great when accompanied with depressing and dark lyrics, or during the long instrumental sections. At close to an hour in length, What It Takes really should get boring at some point. It’s not like the band ever mixes things up—they do one thing, and they do it well. They do it well enough to keep you listening for the record’s duration. That may have something to do with the fact that I am the target audience for this type of whiney and depressing music. Maybe the average reader will find this stuff insufferable.